Actors David Dastmalchian, Tip "T.I." Harris, Michael Douglas, Judy Greer, Michelle Pfeiffer, Hannah John-Kamen, and Evangeline Lilly, Director Peyton Reed, Actor Paul Rudd, Producer Stephen Broussard, Actor Abby Ryder Fortson, Executive Producer Victoria Alonso, Executive Producer Louis D'Esposito, actor Laurence Fishburne, and Producer Kevin Feige attend the Los Angeles Global Premiere for Marvel Studios' "Ant-Man And The Wasp" at the El Capitan Theatre on June 25, 2018 in Hollywood, California. 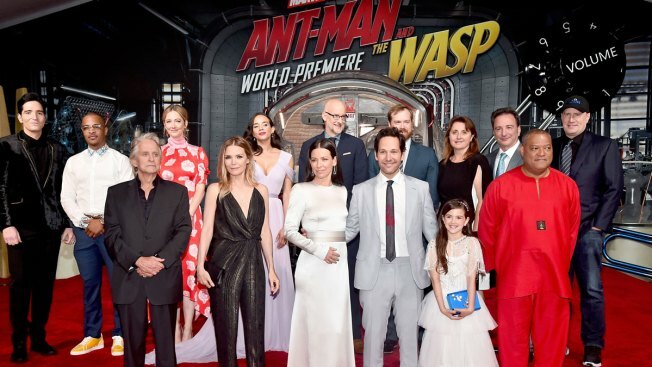 It took 20 films and 10 years, but the Marvel cinematic universe finally boasts a film with a female character its title, the upcoming "Ant-Man and The Wasp." Evangeline Lilly plays The Wasp, a superhero who fights alongside Paul Rudd's Ant-Man. Her character is the first female superhero to get title billing in Marvel Studios' sprawling film lineup. Lilly says while she's wondered whether celebrating The Wasp's appearance in the title is "making a mountain out of a molehill," but she feels that it is a big deal, and it's "about time." Director Peyton Reed says he worked closely with Lilly to make sure her character didn't fall into ridiculous stereotypes, such as being glammed up immediately after action sequences. "Ant-Man and the Wasp" is in theaters Friday.